You have to be careful when describing an artist as unique, an expression often over-used to voice the talents of indeed, many a good singer songwriter. Tom has a permanent disability, caused by a spinal injury when he was 17. People would call his disability serious (it affects his legs, hands and fingers), yet he believes his impairment feeds his creativity, inventiveness and musicianship. Irrespective of this, Tom Doughty has been described by some of the biggest names in the industry as one of the world’s finest lap steel players. With four critically acclaimed album to his credit, there are no shortages of amazing comments about his new album ‘Can’t Teach An Old Dog’ (set for late summer release). Once again his ability to seamlessly blend pop, jazz, folk, and his world music influences are highlighted, along with his instantly recognisable lap steel guitar style, vocal lines and the uncanny knack to be able to write and produce catchy songs with instant hook lines. ‘Can’t Teach An Old Dog’ has been described as ‘..a slide player’s masterpiece’ whilst other comments from the media include: ‘…the album I’ve been waiting for for 40 years’. Choose and download appropriate biog for your needs from these pdfs. BIOG 2014 VS 72 very short 72 words. 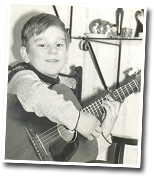 Tom first started playing the guitar when he was a child. Apart from being shown a few chords by his elder brother, Tom was self taught. He initially, learnt his craft through interpreting what he heard on records and later through watching other guitar players. As an early teenager, Tom had become an accomplished finger style guitarist and recalls playing the Davey Graham tune ‘Angie’ at a school concert. He was, and still is avid listener and admirer of other musicians. Early influences included Renbourn and Jansch, Martin Carthy, Nic Jones, Big Bill Broonzy and Led Zeppelin. In a road traffic accident in 1974, Tom permanently became a disabled person. His impairment also affected his fingers and prevented him from playing music. He recalls the frustration of creating music in his head but not being able to hear it in the air. With the tenacity and creativity of a new explorer, finding ways to work around his limits of hand movement, Tom has discovered how to return to being a musician. He has developed absolutely new and unique techniques for playing slide guitar, with a sensitive touch and full of feeling. In 2003, Tom released his first album ‘The Bell’ to critical acclaim, 2006 saw his second CD ‘Running Free’ and by late 2008, ‘Have a Taste of This’ was released to major interest at home and abroad. All of Tom’s records have been featured on National and local radio in the U.K. and abroad. His albums are refreshingly different and both his song writing and composing skills are respected. The first guitar came from a yard sale when Tom was about 7 years old. His older brother showed him a few chords and before long Tom was playing a riff from the track ‘Money’ straight out of the first Beatles LP. He just seemed to hear it and worked out the notes on his own. The music around him was the folk/blues revival of the 60s mixed alongside The Rolling Stones, The Beatles, Woody Guthrie and most types of music that were regularly aired through his father’s LP collection. ‘Dad played a harmonica, but he listened to so much music; I was surrounded by everything from Opera, Classical, Musicals, through to the likes of Cole Porter to Jim Reeves’. At seventeen, Tom was considered an accomplished finger style guitarist amongst his peers. In 1974, Tom was involved in a traffic accident that caused the permanent spinal injury. This put paid to his guitar playing exploits because Tom has no movement in the fingers of his left hand and a very primitive claw movement in the right, but he recalls playing guitar all the time. ‘In my head of course; not literally, but it was there. I would listen to music as I always had, and start to work out the guitar parts, chord structures or accompaniments in my head. It was just something I did – in silence’. Sometime around 1990, Tom took a previously redundant guitar off the wall hanger and placed it on his lap. He used a tube on his forefinger which he dangled on the strings. Soon, he adapted picks with twists and turns in them to hit the strings at the correct angle, raised the nut, put weight into the tube and embarked upon, which was for him, a totally new approach to guitar playing. The catalyst for this Eureka moment was hearing a song called ‘Louise’ from an album called ‘Greenhouse’ by Leo Kottke. ‘It’s the first track on the album and as soon as I heard that sound, I knew I had to somehow be able to play again; there was no doubt’. ‘There’s no right or wrong way to play lap slide. Although technique is important, technique can be a personal approach. It’s the music that comes out of the instrument that matters most. Perhaps partly due to my previous years of frustration and playing music only in my head, I realised that I could compose new music and my approach to the instrument was different from other lap players in that it is based on chord structure and voicing as well as melody lines. Shortly after returning from his first IGS in 2003, Tom recorded his first CD, ‘The Bell’ and over the next four years he wandered stateside to three more IGS weeks, some travelling and a few gigs. A second album, Running Free was released in 2006 which featured more of Tom’s song writing skills and a few collaborations with other instruments, notably Cello, and African Cora. By 2008, Tom had released his third album, ‘Have a Taste of This’ and had travelled substantially including spending time in Kolkata, India with Debashish Bhattacharya, the Indian Slide Guitar Master. Tom’s style and approach have become instantly recognizable and unlike that of any other slide player. Exploiting his song writing and continuing to push boundaries, he has re-invented slide playing to suit his needs, finding voicing and chord structures that are unique to him. Developing tunings for particular tunes and situations is all part of it; from minimalist melody lines to complex jazz chords, ‘Anything can be played on a lap guitar and the perceived restrictions of the instrument serve to widen our imagination to get the most from it’. His gigs have taken him throughout the U.K., into Europe including Poland and further afield into Canada, the USA and in 2014, Qatar where he played a solo piece with The British ParaOrchestra and Qatar Philharmonic. https://soundcloud.com/tom-doughty/doughty-two-pieces-solo-around-la-folia His four CDs have received critical acclaim and international radio air play.